We print and produce placards attached with wooden sticks ready to use. 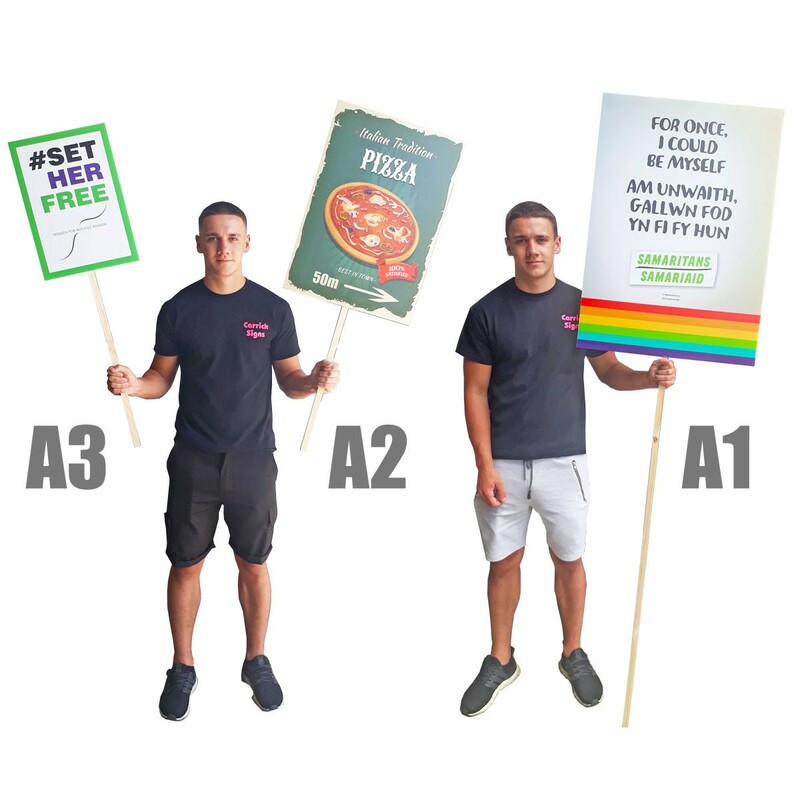 Placards are the go to choice for protest marches or local street advertising (for example arrows pointing to your shop or business) or any kind of ‘walking street signage’. Our placard boards as standard are made of 4mm corrugated plastic boards (Correx®). Correx® boards are lightweight, strong and cheap at the same time, making it the ideal material for the production of placards. Placards can be produced single or double sided, double sided placards are produced with two separate boards attached on either side of one wooden stick. We also offer two lengths of the sticks depending on your preference. Shorter placard sticks are better for holding the sign in the air while walking, longer sticks are long enough to rest them on the ground. The latter may be a more comfortable option when there is not much need for carrying the placard and therefore a more preferable option for street advertising and standing protests. You can also lean on the stick while walking for better comfort. Some of most common uses of placard boards are all kinds of pickets, demonstrations, protests and strike actions organised by workers or labour unions (trade unions). Being very lightweight, Correx® demonstration placards are ideal for marching longer distances and, as mentioned above, you can have two different lengths of the sticks to suit your requirements. Also, our picketing boards/posters can be tailor-made in case you have any special requirements regarding size or shape. We print full colour directly on Correx® boards with UV long lasting inks. This means there is no extra charge for more colours and you can even have photographs printed for the same price. If you need a different shape of the board, we are able to produce custom sized boards. Our routing machines can cut signs to any shape so all kinds of shapes like ovals, stars or arrows are possible. Do the placards come with sticks attached? Or do I need to attach the board myself? We print and assemble all placards in house, meaning that when they arrive with you they are ready to use with no messing around. If I order double sided placards, won't one side be obscured by the wooden stick? No, we produce our double sided placards with two separate boards attached to either side of one wooden stick, meaning no part of your artwork will be covered up. Can I order a blank placard? Yes, if you just need a placard setting up and have your own artwork already sorted by another means, just let us know and we can arrange to send you an assembled placard without any print. Can I have my placard cut into custom shapes? Yes, if you would like your placard cutting into any specific shapes (such as a lollipop style) just let us know your specific requirements. Note prices will vary for custom cut boards.